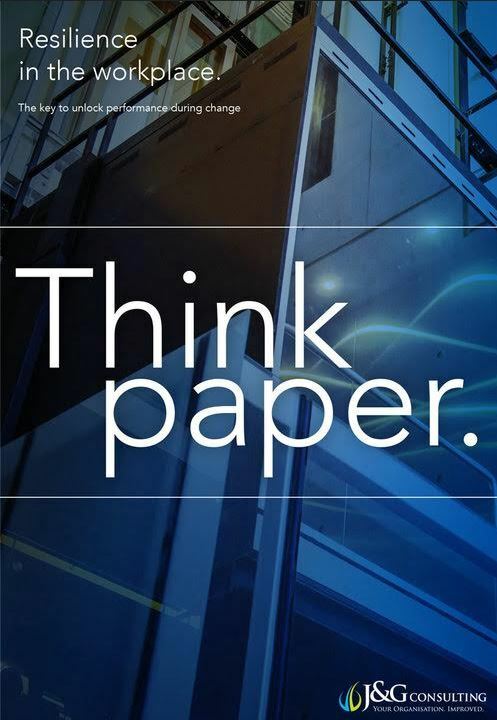 In the modern workplace, it often feels like uncertainty is the only certainty, writes Mike Hennessy, principal consultant, facilitator, psychologist at J&G Consulting, who has just released his new ThinkPaper; Resilience in the Workplace. In the modern workplace, it often feels like uncertainty is the only certainty, writes Mike Hennessy, principal consultant, facilitator, psychologist at J&G Consulting, who has just released his new ThinkPaper: Resilience in the Workplace. Organisations and the environments in which they operate are increasingly characterised by volatility, uncertainty, complexity, and ambiguity (VUCA), and the pace of change in the technical, social, political, market and economic realities of our world means that VUCA is here to stay. In response to their environment, people in developed economies are now working harder and longer than ever before (and Australians more so than most), placing additional strain on employee wellbeing. People who work in the ‘caring professions’ (e.g. nursing, allied health, teaching, social and community work) can be at even greater risk of burnout, psychological strain and turnover than their peers in most other professions; they perform emotionally demanding work, often in an environment where funding is tightly constrained and improvements in productivity must be driven by stretching existing resources even further. Unfortunately, “doing less with more” creates a false economy – people who are struggling to manage their own stress are unlikely to provide the same level of service to their patients and clients as they would if they were managing their stress effectively. Sub-optimal performance creates additional pressure, and so the cycle continues. 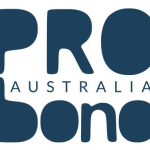 In the not-for-profit sector in Australia, the challenges are currently compounded by pervasive market reform such as the implementation of the NDIS, which requires many organisations in the sector to completely transform themselves from top to bottom, and the consolidation of smaller providers under threat of folding in a user-pays environment. What are the smart organisations doing? It is impossible for organisations to completely control their operating environment, but they can – at least to a certain degree – influence how their employees respond to the challenges the environment presents. Resilience is having the skills and capacity to be robust under conditions of strain and change. People who are more resilient don’t merely hope and plan for the best, they acknowledge the impact of negative events and get on with the business of returning to normalcy. And they use these negative events as learning opportunities on the path to bigger and better things. The good news is that humans are a resilient species, and as individuals our resilience is a resource which can be developed through deliberate practice. People who operate with a high level of resilience have generally learned to be flexible, adaptive and how to maintain their motivation at work. This allows them to make quality decisions, maintain mental focus and preserve energy even when the sand shifts beneath their feet. A growing body of evidence supports the efficacy of targeted resilience-building programs (e.g. workshops, coaching and self-guided practice exercises) in the workplace, particularly for individuals who are at higher risk of stress in the workplace. Designing your resilience building plan: Where to start. Resilience is a systemic idea. 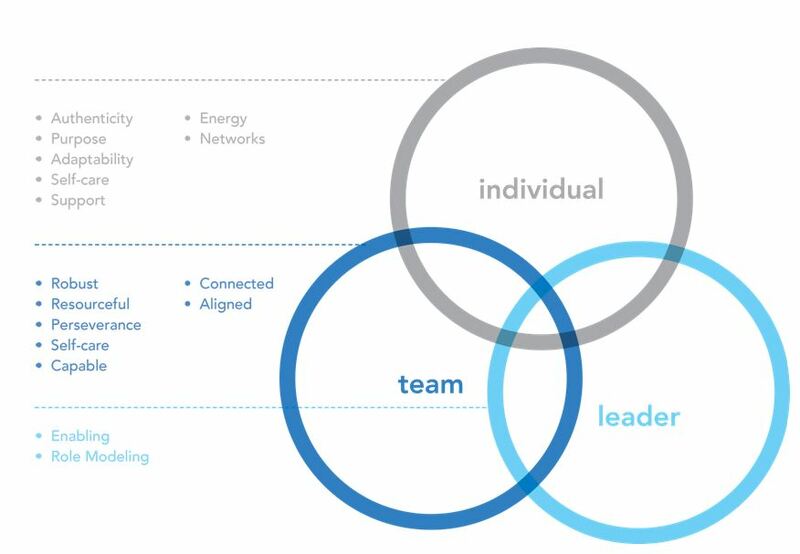 It can be considered at a whole of organisation level, linked to enterprise risk and strategy, and it also operates at an individual and group level – a group of resilient individuals does not necessarily make a resilient team, so each level needs to be considered somewhat independently. Focusing on leader resilience is a great place to start; leaders who exhibit personal resilience are in a much better position to role model resilient attitudes and behaviours and weave these into the culture of their teams. It’s also important, in a world where organisations are overwhelmingly busy and executive agendas are crunched, to have a clear plan of attack for progressing your Resilience Building program of work. 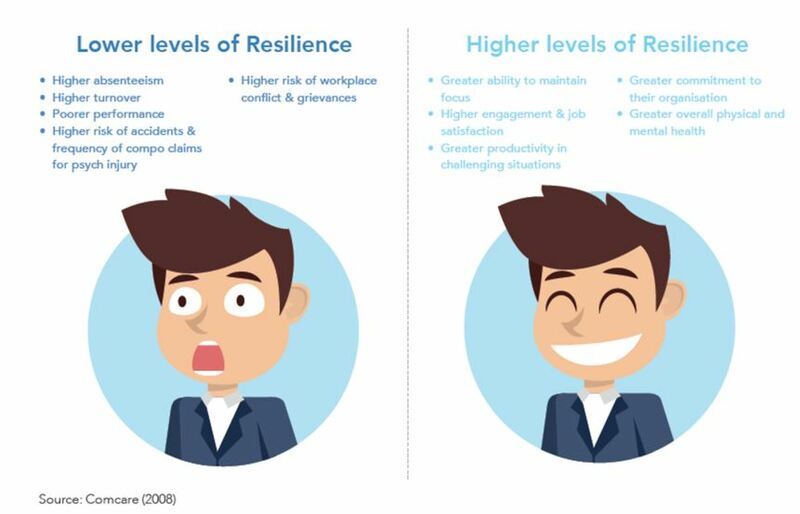 Research spanning diverse industries points consistently to the benefits of resilience, but the results speak loudest for individuals, organisations and industries under particular stress. If there was ever a time for a deliberate focus and targeted investment in workforce resilience within the Australian not-for-profit sector, it is now. When the world around you is changing so rapidly, any investment in your own resilience, and the resilience of your staff and your organisation, is a wise one. 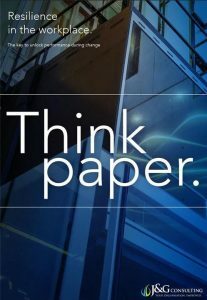 Mike Hennessy of J&G Consulting, has just released his new ThinkPaper; Resilience in the workplace – The key to unlock performance during change, which explores the case for building this vital resource in greater detail, and provides a great starting point for resilience conversations in your workplace. You can download it here. Oh no, another article that is suggesting that the responsibility for managing workplace stress sits with the employee, not the employer. Our legislation and industrial instruments place an obligation on all employers for the health and safety of its workers, and makes little distinction between people’s physical and psychological/mental well-being. What articles like this, resilience training and mindfulness courses all do is give employers a get-out-of-jail-free card, shifting the burden for addressing workplace stress from themselves to their employees. It’s quite ironic that if a workplace is creating excessive stress that we think it’s OK to expect our already stressed employees to learn a new set of skills and be the answer to the problem. Whilst I do appreciate how resilience training can help some individuals, it is an ameliorative response, and does nothing to reduce the stressors that a workplace has created and subjects its employees to. We’ve all worked in or heard about toxic work environments that are incredibly stressful places to spend the majority of your waking hours. These training programs will never transform these organisations and make them great places to work. We need to change the conversation and hold companies accountable for the stress they inflict, and place expectations on them to undertake primary interventions to eliminate or reduce the stressors their business design, processes, policies, systems and leadership have created. The academics in the field of workplace stress have been telling us for over two decades exactly how to do this, but their advise keeps being ignored because we give them an easy out by promoting employee training as the answer. There’s 3 levels of response and intervention an organisation can take in respect of managing their workplace stress. There’s tertiary or reactive interventions such as counselling, rehabilitation, psychotherapy and pharmacological treatments that are focussed on the individual. Secondary or ameliorative interventions include resilience training, mindfulness courses, team building events, apps and software solutions, and work at the individual and/or group level. Primary interventions are those that directly target the sources of stress within a workplace, and operate at the group and organisational level. The extensive academic evidence concludes that tertiary interventions are the most costly and least effective way of managing workplace stress. Secondary responses tend to be less costly and more effective. Primary interventions on the other hand are shown to be the most sustainable and effective way of controlling and minimising workplace stress, and that the costs to the organisation of taking this approach are the lowest. Of the three intervention levels only primary interventions fulfill an organization’s legislated occupational health and safety obligations by adhering to the Management Standards and the Hierachy of Controls Model for managing OH&S risks. So why aren’t articles like this focussed on educating our business leaders about using primary interventions? All of the information, methodologies and tools that a business might need to tackle their sources of stress are in the public domain. If we look to the Nordic countries where primary interventions to manage psychosocial risks are mandated, we find, by no small coincidence, some of the happiest people on the planet. We must change the conversation on workplace stress, start holding organisations accountable for the stress that they create, pressure our regulators to treat psychological injury no different to physical injury (our legislative instruments make no distinction so why should our regulators) and start listening to what the academics and researchers on workplace stress have been telling us for decades.